Almost 1 million prime-age Americans were dragged out of the 2015 labor force by Chinese-supplied fentanyl, Mexican heroin and U.S-made prescription opioid drugs, says a report by the American Action Forum, a business-first advocacy group. The economic impact of this opioid drug disaster adds up to $91 billion in lost productivity during 2015, alongside 42,000 deaths in 2016, says the group, which also advocates for easier migration of foreign workers. 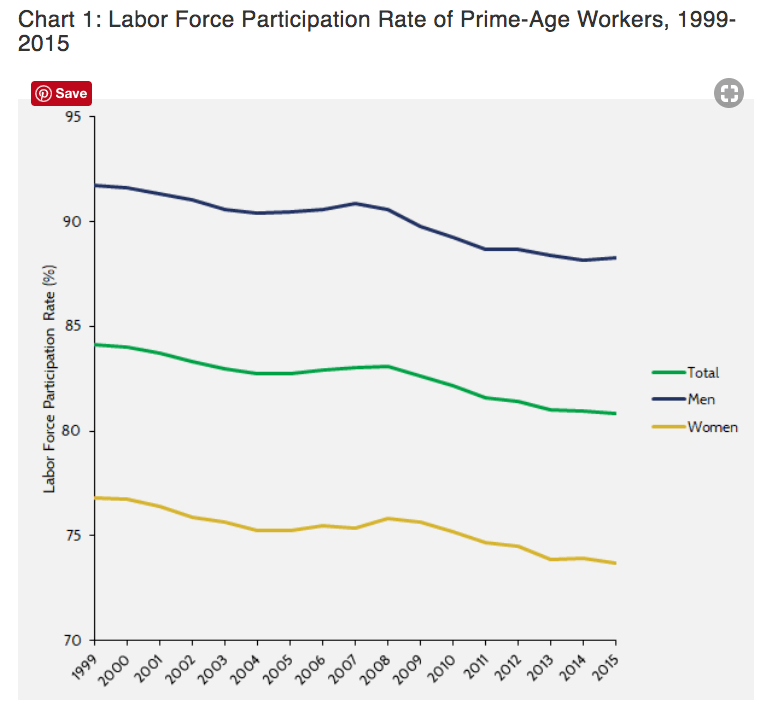 The report shows that 4 million prime American men and women — aged 25 to 54 — left the workforce between 1999 and 2015. The huge departure has been blamed on trade, on technology and the decline in blue-collar wages, and it accelerated in 2008 when the economy collapsed because of the government’s risky and bipartisan push to expand home-ownership. Overall, roughly one-quarter of the 4 million Americans who quit the workforce were also entangled in drugs, says the AAF report, which does not offer any recommendations for fixing the drug-and-workforce problem. However, President Donald Trump has repeatedly argued that a border wall can reduce the flow of drugs, and that immigration reform will raise wages, drag Americans back to work, and away from drugs. Although labor market shifts that have lowered demand and wages for less skilled workers have not been a focus of this study, policies that raise after-tax wages for low-wage workers, such as an increase in the minimum wage or expansion of the Earned Income Tax Credit, would also likely help raise labor force participation. Post-2015 data shows Trump’s immigration-and-drugs plan seems to be working. For example, since 2014, the number of Americans who say health problems keep them from working has fallen by 1.5 million as CEOs are forced to hire marginalized Americans workers because populist voters have blocked multiple amnesty bills since 2013. Because the bill would increase the rate of growth of the labor force, average wages would be held down in the first decade after enactment by a reduction in the ratio of capital to labor. America’s growing dependency on painkillers has evolved into a full-blown crisis. In particular, millions of people have developed opioid-related substance abuse disorders, leading to a rapid rise in opioid overdoses. In 2016 alone, over 42,000 people died after overdosing on opioids, a 28 percent increase from 2015. Moreover, in 2016, for every fatal opioid overdose, there were over 30 nonfatal overdoses. To put these figures in perspective, consider that the average annual lost output of $43.9 billion equates to $140 per U.S. resident. The $91.6 billion lost in 2015 translates to $290 per resident. Moreover, between 1999 and 2015, real GDP grew at an annual compounded rate of 2 percent. Had opioid dependency not drawn so many workers out of the labor force, real GDP would have grown at a 2.2 percent rate, a 0.2 percentage point (or 10 percent) increase in the economy’s growth rate. Most recently, Altarum estimated that since 2001 the opioid crisis has imposed over $1 trillion in economic costs. While the study incorporates more economic costs than the CDC and CEA reports, it suffers from the same limitations by combining different kinds of costs. The Altarum estimate contains both the reduction in productivity among those still in the labor force and the lost lifetime production from opioid-related fatalities, both of which negatively impact economic output. Like the other studies, however, Altarum also combines those costs with costs that do not negatively impact GDP: spending on health care, criminal justice, and education. Trump’s pro-American immigration-reform policies, however, are being fought-tooth-and-nail by business-first Republicans, progressive Democrats, business lobbies and their media allies. For example, the Senate blocked Trump’s immigration reforms in February, Congress’ 2018 omnibus in March only granted $641 million in 2018 to build 33 miles of border fences, and Democratic leaders are threatening to sue if Trump uses the military to build more fencing. But the federal government inflates the supply of new labor by annually accepting roughly 1.1 million new legal immigrants, by providing work-permits to roughly 3 million resident foreigners, and by doing little to block the employment of roughly 8 million illegal immigrants. Nationwide, the resident population of foreign guest workers includes roughly 1.5 million university-trained guest workers, such as L-1s and H-1Bs. The Washington-imposed strategy of economic growth via cheap-labor mass-immigration shifts wealth from young people towards older people and to investors. The strategy floods the labor market with foreign labor; it spikes profits and Wall Street values by cutting salaries for manual and skilled labor offered by blue-collar and white-collar employees. It also drives up real estate prices, widens wealth-gaps, reduces high-tech investment, increases state and local tax burdens, hurts kids’ schools and college education, pushes Americans away from high-tech careers, and sidelines at least 5 million marginalized Americans and their families, including many who are now struggling with opioid addictions.